There was something I liked about her as soon as she entered the room-a lightness and fluidity to her presence. I was taking a 12-week yoga series at The Loft on Divisidero with Jason Crandell as the lead teacher. Jason’s co-teachers were Kim and another great teacher, Josh Gottlieb. She came into the large yoga studio smiling, walked around to each student, shook hands and introduced herself. That’s a five-star move in my book. After a few weeks Jason handed over the reigns to Kim and Josh to finish up the series. On Kim’s first night of solo teaching she revealed a perfect balance of focus and humor as she lead us though postures. And I love some humor in the yoga studio! Even the gentle assists she offered me as I held down dog in awareness of all my parts from fingers to toes seemed just right. It was to my delight that just a few weeks after this series, Kim was going to offer one of her own. I also love a great class concept and Kim was calling her series “Soft & Strong Vinyasa”. Her description of her goals for the series and weekly themes struck a chord and I couldn’t wait to get back to The Loft for class. It is my pleasure to introduce you to the gifted teacher, Kim Sin. You can find us both in class on Wednesday nights. I’ll be the guy with his right arm in the air when everyone else has their left arm up. This week in class you shared a bit of your story regarding your personal yoga practice beginning as purely physical but then shifting to become more. Can you reflect on this part of your journey? I first approached a yoga mat after ending eight years of studying classical dance. My motive to try yoga was to exercise and be physical. For seven years, I tried a myriad of styles ranging from Bikram to Hatha. At age 25, I was consistently practicing Vinyasa. During this time, I started to feel like I was getting more from yoga than just physical benefits. I felt like I was quenching a thirst that I didn’t know my soul/mind and body needed. I started to feel a connection, a wholeness I had never felt before. I would want to cry during practice; it was kind of bizarre! Two years later, I was working a passion-less job and noticed that all I wanted to do was practice yoga. I enrolled in a teacher training without the intent to teach, but just to learn as much as I could, especially about the other limbs outside the physical (like meditation, self-study, ethics). During teacher training, I was head over heels in love. I felt like I had met my soul mate or a partner for a lifetime. I enrolled in my second training, met my present teacher and mentor and quit my day job to teach full-time. Yoga today is my everything. It started out exercise based, but through the physical practice, I’ve learned to be more aware of my decisions and thoughts, ego, levels of relaxation and tension, and general habits. This awareness is with me whether I’m on my mat or not. Yoga has influenced the way I eat, rest, engage with people, engage with myself, my relationships, and so much more. Basically, my physical body is a tool I use to learn about myself so I can still my mind & the chaos of life. Lately, I’ve been wanting to move my body less, and just sit – which is wild! In your current 12-week yoga series “Strong and Soft Vinyasa”, you describe part of the mission as “to find the balance between strength and flexibility and alignment and fluidity in the Vinyasa practice so that this same tone can extend outward into everyday life.” What connection can you make between yoga practice and everyday life? I believe that what you do on your mat physically, mentally, emotionally is a metaphor for what you do in everyday life. This connection can be direct. In regard to the body, we have unconscious habits that we learn to notice in the practice. When we notice these habits on the mat, we can explore accepting/honoring these habits and then play with making subtle shifts to create more balance. All of this work from noticing, to accepting, to creating subtle shifts may sound contrary and simple, but I don’t think they are! This work we do on the mat (subconscious or conscious) we can integrate into everyday life. For example, when I notice that I rush difficult poses because I feel tightness, I breath more deeply and slow down – this immediately makes me relax and feel better in the pose. I apply this same process to when I’m stuck in the traffic on the road. I take some deep breaths, slow down, and immediately feel like relaxed. I teach yoga because…it is my love and I enjoy it. Yoga has changed my life and I believe it can change the lives of others. It is endlessly entertaining. It gives me purpose, patience, strength, flexibility, community, and happiness. The book that has inspired me the most on my yoga journey is…I feel that I have a lot more reading to do on my journey!!! Although not technically a book, the resource I refer to the most is my teacher training manual from my teacher, Jason Crandell. I relate to his teaching very deeply, I think this is why I refer to it the most. I sometimes need a refresher on actions of particular postures, or how to sequence, and what I should think about when I’m trying to guide other people, I get the boost I need through the manual. I also resonate deeply with the Yoga Sutras of Patanjali. My favorite sutra is 2.46, sthira sukham asanam: practicing yoga with equal strength and relaxation gives rise to harmony in the body. What’s the biggest misconception about yoga that you’ve encountered and would like to address? When I speak with the majority of new practitioners, they’ll often say, “but I don’t really want to try because I’m not flexible.” This is the biggest misconception I see – that you’re supposed to have a flexible body to do yoga. I think the only requirement to practice yoga in the physical sense, is that you can breathe, period. Range of movement in your limbs is irrelevant. A lack of flexibility can actually be a great tool in a yoga practice. Why do you practice Vinyasa yoga as opposed to other forms? What sets a Vinyasa practice apart from another like Iyengar or Ashtanga and is there a connection between all the forms? I practice vinyasa yoga because it feels appropriate for my body and mind. There are different styles within the realm of vinyasa – & I’m kind of picky! My teacher guides me through an alignment focused, slow, intelligent vinyasa that feels more like moving meditation rather than fast vinyasa (which can feel like aerobics or a dance class to me). I tend to move, think, drive, eat, and speak quickly in daily life. A yoga practice that is slow and mindful feels very good and balancing to me. Vinyasa yoga is hatha yoga (physical yoga) where postures are linked with breath. When poses are executed in a flowing manner, alignment can be tough to manage if speed is prioritized over stability of breath and keeping with the pace of others or a teacher. Iyengar yoga is hatha yoga too, but you do a small amount of poses with a heavy focus on alignment w/ long holds. Ashtanga is another form of hatha. Ashtanga is what vinyasa is derived from. It links breath with a set sequence of movement. I think alignment is a small focus in ashtanga while attention to breath and progression through sequence is paramount. Vinyasa is a nice balance between the alignment focus of Iyengar and the fluidity and breath focus of ashtanga. There’s definitely a connection between these three styles. They’re like different roads that take you to the same place, inner stillness. Building a yoga practice is not about…Satisfying someone else’s expectation about what a practice is supposed to look, feel, or be like. Through the yoga practice, you learn to honor yourself and trust an inner knowledge (divinity) that is within us. This knowledge will guide your practice into what is appropriate for you in each moment that you’re in it. Since we are all different and unique, one’s practice is different and unique. Building a yoga practice is about tuning into yourself and making your yoga intimately yours. My very first yoga teacher said “YOU are not your thoughts. During your practice become a witness to your thoughts. Imagine them playing in front of your as if watching a movie on a screen.” This stuck with me and that was 1995! Many of us have the challenge of being wrapped up in our mind/thoughts. How can yoga help to create balance and allow us to become a better witness? Using the physical body during yoga can be an access point to connecting with yourself through the sensations poses create as you do them. This connection to sensation creates a mental/body connection that is essentially meditation happening. This meditation is the act of witnessing. Many of us exist relying on our thoughts as reality, when many of our thoughts my be false due to habitual patterns of thinking or ego based. The ability to witness, learned through yoga, can help us to distinguish amongst realistic thoughts or inaccurate thoughts. Witnessing and seeing the truth can influence behavior, which can help to create balance in all aspects of life. If you ended every yoga class with the same words/message to inspire students, what would they be? Commend yourself for practicing and getting to know yourself. The more you know yourself, the more deeply you can connect with the people you love. Learn more about Kim including her class schedule (and her AWESOME Yoga Journal cover!) on her website www.kimsinyoga.com. 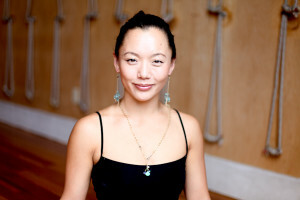 You can also find her on the weekly schedule at Union Yoga in Russian Hill and The Loft in Lower Haight.